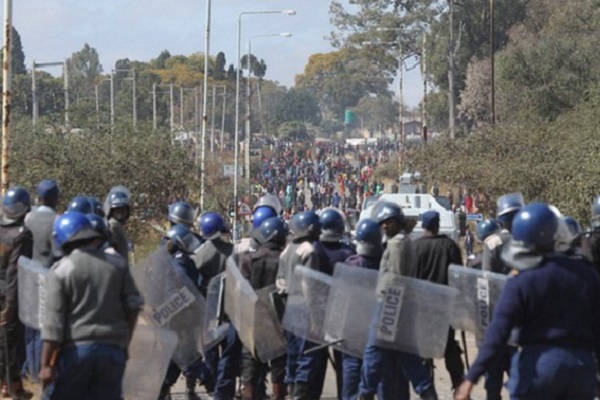 Police have been ordered to stand down and not engage the angry mobs sprouting around Zimbabwe, an online publication has revealed. General Augustine Chihuri is alleged to have issued the emergency orders via a swift radio transmission(serial no. MMM 876/2016) ordering that all police officers countrywide must with immediate effect not to engage the protestors and be careful not to agitate the angry masses. Chihuri made his announcement amid clashes between police and protestors in Harare yesterday. One cop was seen with bloody head injuries of an extremely gory nature. The protests were started after kombi owners began demanding an end to random road blocks and cash swindling schemes by the cops. In a rushed radio emergency announcement seen by ZimEye, ZRP bosses under Chihuri’s instruction sought peace with the masses issuing an immediate withdrawal. “..ALL OFFICERS ARE ON STANDBY DUTIES THAT DO NOT NECESSARILY INVOKE ROAD BLOCKS. THE AMOUNT OF ROADBLOCKS SHOULD BE REDUCED AND IN ANY EVENT SHOULD BE SERVING THE PURPOSE NOT INCONVENIENCING ROAD USERS”. “ANY DIVERSION FROM THE ABOVE WILL NOT BE TOLERATED. THE PUBLIC WE ARE POLICING AT THE MOMENT IS VOLATILE AND ANY DIVERSION FROM THE PROPER POLICING METHODS WILL RESULT IN RIOTUS (sic) SITUATIONS”. Chihuru must be caught and burnt alive, we won't get fooled by his pointless freaking words. Police, army and public must just turn on the government, it makes sense they'll be well out numbered. It's very important for the police not to interfere with mass opinion resulting in planned demonstrations because this thorny life in Zimbabwe affects all if us. Police and Army stay away. will things change after the violence?